Upma is traditional south indian breakfast dish made from semolina (Rava)….It granular texture melts in mouth when this diesh is served hot. Looking at the texture of cornmeal thought why not try upma; Outcome was surprising and could say tastewise it was same as Semolina but corn meal has healthy carbs, fiber and other nutrients. Corn meal is gluten free making it a good whole grain choice for people with wheat allergies. It can be substituted for wheat in some baking items. 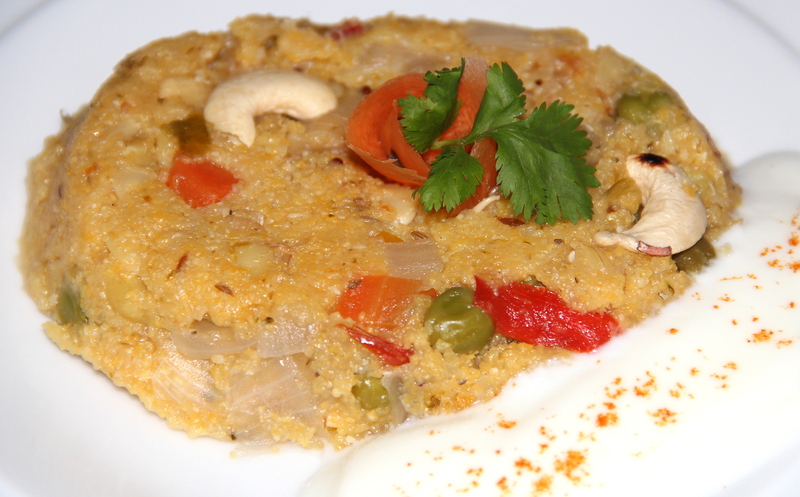 So try this variant upma as part of your breakfast or as an evening snack. Heat oil in a pan add mustard seeds and curry leaves as it splutters add onions and green chillies fry for 2-3minutes. Now add capsicum, salt, lemon juice and give it a stir. Now add cornmeal and keep stirring while you add ( it may form lumps) and saute 2-3minutes. Add water to this and mix and cook until the mixture thickens and cornmeal is cooked. Add chopped coriander and give it a toss. Using vegetables are optional, can just use onions and make this as a variation. Posted on June 25, 2014, in Breakfast, Indian, Main dish and tagged Chitras healthy kitchen, Cornmeal recipes, drchdietfood, Gluten free Upma, Gluten free vegetarian recipes, Upma recipe. Bookmark the permalink. 8 Comments. I like the look of this. Will definitely give it a go. I am intrigued! This looks good!